A number of furniture and equipment are being used in hospitals, clinics and in other healthcare applications. The wide range of furniture products is available to meet every requirement in healthcare industry. Global health furniture market is envisioned to witness a robust growth during the forecast period. Global market of health furniture is likely to grow at a considerable compound annual growth rate (CAGR) during the forecast period i.e. 2017-2024.Further, the market is thriving on the back of rapid enhancements in healthcare infrastructure across all regions. Rapid emergence of new hospitals and other healthcare facilities are believed to be the driving factors behind the growth of global health furniture market in upcoming years. Regionally, global heath furniture market is segmented into five major regions North America, Europe, Asia Pacific, Latin America and Middle East & Africa region. Among these regions, North America health furniture market dominated overall health furniture market in 2016. This growth in North America region can be attributed to presence of large number of hospital and advanced healthcare infrastructure in this region. According to American Hospital Association, the total number of registered hospitals in United States reached 5,534 in 2015. Apart from North America region, Asia Pacific is likely to emerge as fastest growing market for health furniture by the end of forecast period. Healthcare sector in Asian countries is booming and growing at tremendous pace due to presence of large base of patients and government initiatives and support to strengthen healthcare infrastructure in this region. According to India Brand Equity Foundation, the government in India is looking forward to increase health budget to 2.5% of GDP by 2025. Further, rapid emergence of new hospitals is also expected to bolster the growth of Asian health furniture market over the forecast period. Additionally, patient rooms segment by application is anticipated to grow at significant pace owing to increasing penetration of diseases and rising number of patients in hospitals across the globe. A number of furniture used in patient’s room such as bed, chair, bedside tables, recliners and others. 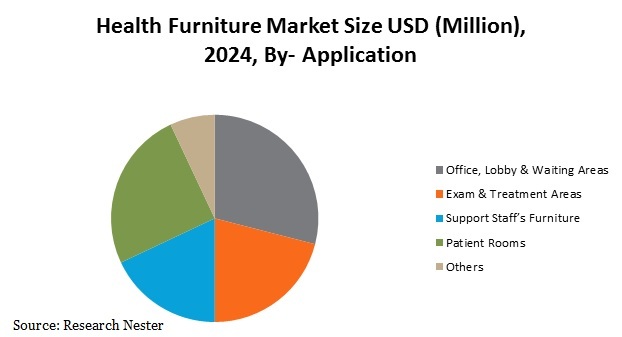 The global heath furniture market is primarily driven by a number of factors such as rapid emergence of new hospitals and other growing health facilities such as clinics, outpatient care centers, and specialized care centers. Further, increasing urbanization and improving healthcare infrastructure are envisioned to drive the demand for healthcare furniture in upcoming years. Additionally, increasing geriatric population across the globe and rising occurrence of various diseases are key factors which are outracing the demand for health furniture across the globe. However, high cost of some experimental furniture is anticipated to adversely affect the growth of health furniture market in future.